This tutorial will guide you through the process of creating a "Pandora's Battery" and a "magic memory stick," which when used in conjunction can unbrick, restore, and downgrade any PSP firmware. Apart from TA-088 v3 units, the process works on all previous "Phat" and Slim PSP hardware revisions to date. NOTE: PSP units equipped with a TA-085 v2 motherboard or above cannot convert a battery to Pandora. 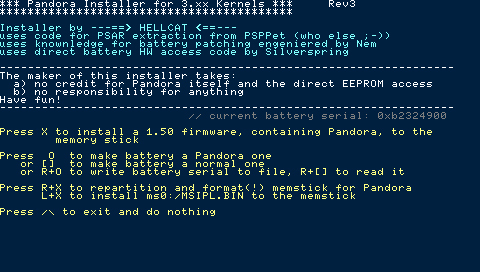 Hellcat's Pandora utility should warn you beforehand if your system board is incompatible. 1. First boot up the PSP into recovery mode (hold R during boot) and make sure the GAME folder homebrew setting is set to 3.X Kernel. Exit recovery mode. 2. Insert the memory stick into the PSP. 3. Navigate to System Settings -> Format Memory Stick on your PSP. Format the memory stick. 4. Connect your PSP in USB mode. 6. Extact the Pandora Installer using WinRAR or any similar utility. Inside, look for a "pan3xx" folder. Copy this folder to "X:/PSP/GAME" on the memory stick. 7. Exit USB mode. Now navigate to the Game menu on your PSP and execute Hellcat's Pandora Installer. 8. Once successfully loaded, you should see a screen similar to the one pictured below. 9. Warning: this will delete all data from the memory stick. Backup any files before proceeding. Press R+X, and confirm with R+L+X to repartition and format the memory stick for Pandora. 10. Restart the PSP and connect it in USB mode once again. 11. All folders and files from your memory stick should be wiped, so create a "PSP" folder and then create a "GAME" folder inside of the "PSP" folder. 12. Once again, copy the "pan3xx" folder to "X:/PSP/GAME" on the memory stick. 13. Download the 1.50 update and save it as "UPDATE.PBP" without the quotes. 14. Copy the 1.50 update to the root of your memory stick (X:\UPDATE.PBP, if X is the drive letter of your PSP). 15. Exit USB mode. Now navigate to the Game menu on your PSP and execute Hellcat's Pandora Installer. 16. Press X to install a 1.50 firmware, containing Pandora, to the memory stick. 17. When the process is finished, press L+X to install the IPL. Now exit the application. 18. Connect the PSP in USB mode. 20. Extract the RAR using WinRAR or similar utility. Inside, you should see a "TIMEMACHINE" folder. Copy this to "X:/PSP/GAME" on the memory stick. 21. Exit USB mode. Now navigate to the Game menu on PSP and execute the application "Time Machine"
From here, first choose "Install IPL loader on PSP MS boot sector," then select "Convert Pandora/DC1-DC4 IPL into TM format." Now exit the application. 23. Connect the PSP in USB mode. 25. Extract the ZIP using WinRAR or similar utility. Inside, you should see a "DC8" folder. Copy this folder to "X:/PSP/GAME" on the memory stick. 26. Download the 5.00 update EBOOT file. Once finished downloading, the file should already be named as 500.PBP. If the file name matches, then copy it to the memory stick root (i.e. X:/, if X is the drive letter of your PSP). 27. Exit USB mode. Now navigate to the Game menu on PSP and execute the application "Despertar del Cementerio v8"
28. While installing, the application will ask you which key(s) you would like to bind DC to. Hold UP on the directional pad. 29. After installing the files, the program should exit back to the XMB. That means installation was successful and you are now in possession of a "magic memory stick." Note: If you have just followed the steps above to create a magic memory stick, steps 1 and 2 below can be safely ignored. 2. Extract the Pandora Installer using WinRAR or any similar utility. Inside, look for a "pan3xx" folder. Copy this folder to "X:/PSP/GAME" on the memory stick. Exit USB mode. 3. Navigate to the Game menu on your PSP and execute Hellcat's Pandora Installer. First, you will want to press R+O to backup your battery serial. If for any reason you'd like to convert your battery back to normal in the future, press R+ to restore the battery serial. This is the preferred method for restoring your battery back to its previous state. If by chance you forgot to back up the battery serial and still would like to convert your battery back to normal, choose the second option by pressing . Once you're ready, press O to convert your battery to Pandora. 5. You now are in possession of a Pandora Battery. Booting a PSP with this battery inserted will boot to service mode instead of the normal PSP XMB. Note: If you are performing the following steps on the same PSP you used to create the battery with make sure to remove and then reinsert the battery. 1. While holding UP on the directional pad, boot the PSP with a magic memory stick and the Pandora Battery inserted. Select "Install 5.00 M33-4" to begin the installation process. 3. Memory stick LED should begin flashing. Wait 2-5 minutes for the install to complete. 4. Now press X to complete the installation - it's imperative that you do this. 5. Boot up the PSP with a regular non-Pandora battery. You may be presented with a BSOD, but just press X or O to restore settings. 6. And that's it. You're now running 5.00 M33-4. Awesome guide. Just wondering, if one already has a pandora battery and magic memory stick with 3.60M33 files, which steps should be excluded? You can skip the battery conversion part. Ok. Just one last question. Since I already have the battery, can I make the magic memory stick on my Slim 3.71M33, or do I need a phat psp with CFW like 3.51M33-4? Yeah you can create the magic memory stick on a Slim since the program runs on 3.X kernel. Nope you're fine... no modifications are made to the PSP when converting the battery. So I formatted my MS, first from the PSP(Slim 3.71M33), then using MSPformat. Then I added the PSP>GAME>despertar_cementerio folders (not the entireDespertar_cementerio2 folder correct)? Then I added the 150, 340 and 371 files to the despertar_cementerio folder, and ran the game. Got an error (which I can't remember), but PSP restarted as normal. Now on my MS I have two additional folders on the root- Registry and kd, (both empty), but no "msipl.bin" file. Ahh.. yes, they go in the root. Thanks for pointing that out. Um. This looks great. 2 questions though, 1.Can i boot to xmb from service mode? (ie use jigkick battery as normal battery) 2. Can i use magic mem stick as a normal memstick after process? Thanks in advance. Sorry if question is silly. 1. Well, I believe you can do that with one of several programs, like the Pandora Boot Menu, but you can also convert the battery back using THIS guide. This doesn't include the 1.5 kernel patch. btw which option actually restores the battery! the first or the last??? and whats the difference? im sure this one dont need pressing R+L like it says in other places. Anyone know why I keep getting the "pseudo format not nescessary" message when I try to mspformat my memory stick ? it means that it's already formatted into the form they needed. You may proceed with the installation.